No matter what the sport, whether its for first place or simply bragging rights, when Boone Central/Newman Grove and Norfolk Catholic meet, you can throw out the records and anticipate fierce competition. The BC/NG Cardinals highlighted another hectic week of volleyball action last Thursday with a nail-biting 25-18, 14-25, 25-21, 23-25, 15-9 victory over the Lady Knights in Albion. “Big win for us!” exclaimed Cardinal Coach Susan Roberts. “We have been struggling with consistency – both in executing on the court and with our mental toughness and energy. “I felt we gave a very steady performance mentally and emotionally in this match. We did have a few stretches were we let some errors pile up on us, but we kept working, kept our energy level high and stayed positive. Boone Central/Newman Grove actually began its week with a long road trip to Crofton and fell to the host Lady Warriors in straight sets (25-19, 25-22, 25-14). 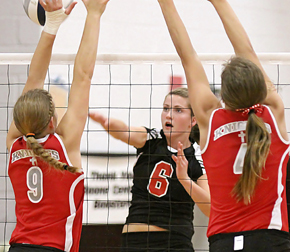 “We played very competitvely in the the first two sets against a tough, athletic Crofton team,” Roberts said. “The difference was just a few errors. We also struggled to get our block up against Crofton hitters. Boone Central/Newman Grove competed in the Central City Invitational Saturday. The Cardinals posted a 1-2 mark in the event and are now 4-6 overall in 2013. “Once we got our engine running, we played some pretty good volleyball,” Roberts said. “We still struggled to maintain consistency, both in execution and mentally, in the first two games.